Michaela Barhite ’12 wants your blood. But it’s OK: she’s a senior nutrition major researching the correlation between environmental chemicals and weight gain in college students. And her research is breaking new ground. First the old ground. Under the direction of her thesis advisor, nutritional science professor Gale Carey, Barhite recorded the height, weight, blood pressure, cholesterol, and other biochemical markers from volunteer students in Carey’s introductory nutrition class. Such recordings have been going on for several years at UNH and are part of a long-term study intended to explore the relation between nutrition and overall health among college students. “So far, I’ve gotten blood from subjects and extracted plasma through centrifugation,” says Barhite, who’s becoming familiar with lab work for the first time by working with Carey. Such chemicals can get into our bodies through exposure or inhalation, says Barhite, where they can be absorbed in our fat and cause more fat cells to be produced. And if this works, it has the potential for a long-term study that tracks the students during the four years they’re at UNH. In order to take her research to the next, “toxicological,” level, Barhite will visit Fluid Management Systems in Watertown, Massachusetts, which designs and manufactures analytical instruments for the measurement of chemical compounds in blood. There she’ll collaborate with other scientists to take a closer look at the samples she’s collected. “They’ve devised a calculation and procedure to send the samples through a mass spectrometer and we’ll correct for lipid and other values,” says Barhite, who considered becoming a physical therapist before discovering her passion for nutritional science. 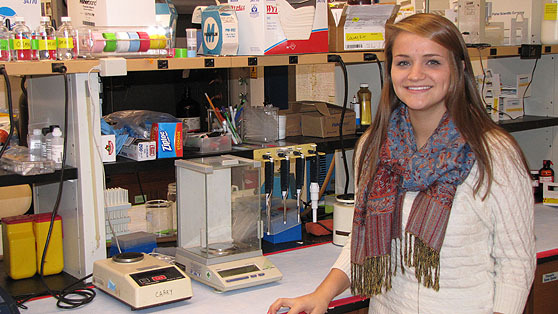 For this student from Hopkinton, Massachusetts, becoming involved in research, from writing proposals to active investigation in the lab, has amplified the value of her educational experience. “This project is not something I would learn in my classes. It’s very specific. Written by Victoria Forester Courtland. Photo by Victoria Forester Courtland.